At the start of 2007, BiLCEM (Computational Electromagnetics Research Center of Bilkent University) Director Prof. Levent Gürel announced that they had solved the world's largest problem in computational electromagnetics involving 42 million unknowns. In less than one year, BiLCEM researchers doubled the world record by solving huge mathematical problems involving as many as 85 million unknowns. This achievement paves the way for solutions to a vast variety of physical problems that were previously unsolvable. Many disciplines, such as medical imaging, nanotechnology, remote sensing, and optics, can benefit. For example, BiLCEM researchers have been able to study the electromagnetic properties of the world's largest metamaterial structures. Metamaterials are artificial materials that exhibit very interesting electromagnetic properties. They have potential applications for invisibility shields and sub-wavelength focusing. Prominent institutions, such as SSM, ASELSAN, TÜBİTAK, and TÜBA, have been supporting BiLCEM's research. "Our next goal is to solve 100 million by 100 million (100,000,000 x 100,000,000) matrix equations." declared Özgür Ergül, a senior PhD student at BiLCEM. Computing facilities of BiLCEM include a number of parallel computers constructed at Bilkent University. The 64-core cluster is the main workhorse, however, Tahir Malas, another PhD student at BiLCEM, was happy to announce that "We are currently in the process of constructing a new parallel computer with 128 cores and 512 GB of memory." Although BiLCEM researchers work with such large parallel supercomputers, their hardware is not even close to the top 500 most powerful computers (www.top500.org). The secret of solving the world's largest integral-equation problems on relatively modest computing resources is explained by Prof. Gürel: "What enables us to break the world records are the mathematical and electromagnetic methods we have been developing. For about 20 years, we have been focusing our intense studies on the advancement of fast algorithms and parallel computing for the solution of large problems." to help contribute to projects, and gain valuable experience. 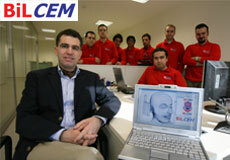 For more information, visit www.cem.bilkent.edu.tr.